Building on the many strengths of a car that has taken the market by storm, Nissan’s new seven-seat Qashqai+2 will be firmly in the spotlight as it made its glamorous world debut at the British International Motor Show last week. It takes Nissan into the heart of the family car market, pitching it against the Zafira and Grand Scenic. "I think we will also see buyers moving from cars like Mondeo," says Jean-Phillipe Roux, head of marketing for crossover vehicles. He admits that buyers probably don't really understand what a crossover is. "They don't wake up in the morning and decide to buy a crossover, but they might wake up and decide to buy a Qashqai, VW Tiguan, or Ford Kuga," said Roux. "I wouldn't be surprised to see buyers coming from vehicles like Toyota's RAV4," he says. With a new Sunderland-built B-car and a smaller A-class car due in 2010, Roux believes Nissan is in a strong position. 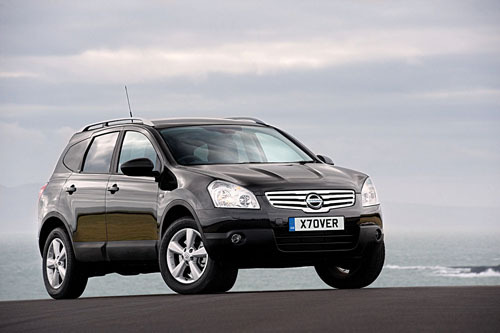 But he does admit that the Qashqai name was something of a challenge to begin with. Now though the fact that the name stands out as something different is proving to be an advantage. With the focus firmly on its crossover line-up, Nissan also launched its striking new Murano. Qashqai has become a huge European success for Nissan with more than 170,000 sales since launch, but in a clear demonstration that you can’t have too much of a good thing, the new Qashqai+2 features the same distinctive style, top quality materials, and genuine driving enjoyment, but brings added space and versatility to create the first family crossover. Designed and engineered in Europe and built at Nissan’s Sunderland plant, its greater length and longer wheelbase accommodates an extra row of seats designed for children or for occasional use by small adults and has allowed luggage space to be expanded by 90 litres. As well as Qashqai+2, a special version of the standard Qashqai will also be making its appearance at the show. The 'Sound & Style' comes luxuriously equipped and as its name suggests, boasts a number of enhanced design features both inside and out, as well as a bespoke Bose® sound system. Nissan’s portfolio of crossovers is completed by the distinctive Murano and visitors to the British Motor Show will be able to see the brand new range which goes on sale towards the end of this year. Designed as a ‘super evolution’ of the original, it boasts elegant new looks, a luxury interior, a 3.5-litre DOHC V6 now developing 256bhp and a more premium driving feel thanks to the new, advanced platform and lighter suspension components. First deliveries do not begin until next spring, but Nissan is already taking orders. In fact it tells us that it has more than 1,000 orders already in Britain for the extraordinary GT-R. Designed to be driven fast and skilfully by just about anybody, the 480bhp Nissan flagship has been widely acknowledged as one of the best handling and most powerful supercars ever. Sixty-two mph (100km ) from a standing start in around 3.5 seconds, and a potential top speed of 195mph (provisional ), are extraordinary enough, but it is the car’s astonishing ground covering capabilities that mark the new Nissan, ably demonstrated by a 7m 29s lap of the infamous Nordschleife (Nurburgring ), one of the fastest ever achieved by a production car. Elsewhere on the Nissan stand visitors have been able to see the Denki Cube electric-powered concept, the Micra 25, and Note Accenta S special editions.